No, You're Not In A Common-Law Marriage After 7 Years Together It's a pervasive myth of common-law marriage. And for a status assumed to kick in by something as passive as the passage of time, it can be complicated to prove. So you've been with your partner for a long time. 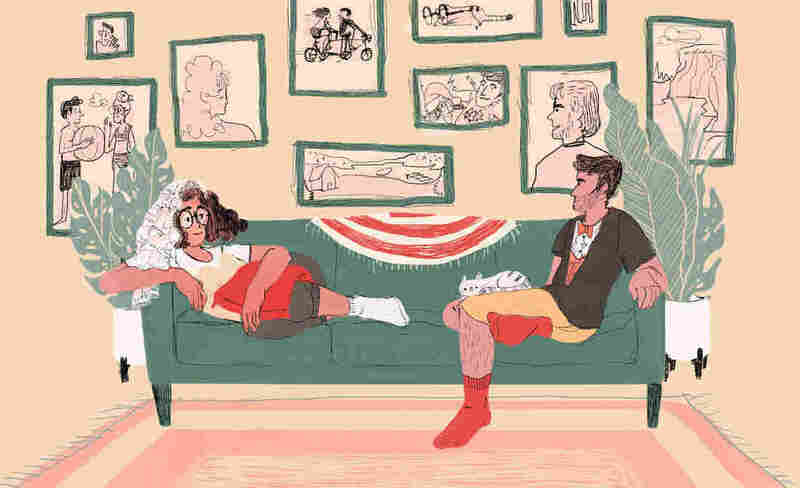 It's time to start considering yourselves common-law married, a sort of "marriage-like" status that triggers when you've lived together for seven years. Right? For one, common-law marriage, which traces its roots to old English law, isn't a nationwide thing. It exists in only a small number of states. Unless you live in one of those states, getting hitched will involve an official "I do" ceremony. Alabama had been one of the states that recognize common-law marriages, but it recently moved to abolish it, a trend that has been taking place nationwide for years. Also, that common-law marriage kicks in after partners live together for a certain period of time? That's a flat-out myth. "By far the most common number is seven years," says family law professor Marsha Garrison of Brooklyn Law School. "I've never figured out where that may have come from and why it's seven years." Couples may eschew a formal, licensed marriage for any number of reasons, like hesitating to make a public commitment or never getting around to making it official. That means you may be passing on the big expensive party or the dreamy walk down the aisle, but common-law marriage is as real and legal as marriage gets. It means you are eligible for all of the economic and legal goodies afforded to couples with marriage licenses — like tax breaks and inheritance rights. But if you break up, you need to get divorced. As in, a traditional divorce. There is no common-law divorce. That's because showing a couple's marital intention often comes down to one partner's word against the other. For a status assumed to kick in by something as passive as the passage of time, it can be surprisingly complicated to prove. Small, intimate details of a couple's life wind up as facts a judge examines. To enter into a common-law marriage, a couple generally has to satisfy these requirements: be eligible to be married and cohabitate in one of the places that recognize common-law marriage, intend to be married and hold themselves out in public as a married couple. In other words, a couple who lives together for a day, a week, a year — states don't have a time requirement — agrees to be married and tells family and friends they are. Where is common-law marriage allowed? Here are the places that recognize common-law marriage: Colorado, Iowa, Kansas, Montana, New Hampshire (for inheritance purposes only), Oklahoma, Rhode Island, South Carolina, Texas, Utah and the District of Columbia. Other states that had at one time had common-law marriage statutes recognize them if entered into before the date they were abolished. They are Pennsylvania, Ohio, Idaho, Georgia, Florida — and starting next year, Alabama. "Usually it's the economically disadvantaged partner who wants to argue that, 'Yes, we were married,' and the [other] partner says no," says Michele Zavos, a family lawyer, who practices in Washington, D.C., where common-law marriages are recognized. That's how it played out before a judge in Rhode Island in a case decided in the spring. Angela and Kevin had been together for 23 years. (We're not using their last names because this story is about their case and not the couple.) According to the judge's decision, "Angela saw Kevin kissing another woman, which in turn prompted Angela to throw Kevin out of the house." Angela argued the couple had agreed to be married back in 1995 and present themselves as husband and wife to family and friends. Kevin testified that they did not have a marital commitment. "We vacationed together, we had family portraits, family parties, interacted with my family, his family," Angela told NPR. "I have a sister who's been married and together with her husband just as long as I and Kevin were, and we live lives just like they did." But Angela had to prove that in court because there was no marriage certificate to point to. "I didn't have that legal document," she says. Angela, citing irreconcilable differences, sought half of their shared house and its contents as well as half of both Kevin's retirement accounts and the value of his life insurance policy. Since marriage is more than just sharing a home and life together, the judge examined everything from how legal and medical documents were filled out to seemingly mundane details of the couple's life. According to Judge Patricia Asquith's decision, some legal and medical documents named Angela as Kevin's spouse and beneficiary; on others, they listed themselves as single. Asquith heard testimony from witnesses who said the couple took vacations together, who considered them to be a married couple and who said they shared a bedroom at home. Kevin said he slept in the basement. There were still other details entered as evidence, according to the ruling: A greeting card from Kevin's mother to Angela referred to her as a daughter-in-law. A message from Kevin's sister called Angela a sister-in-law. A Christmas card addressed them as "Mr. and Mrs."
Still, the ruling shows that though Kevin insisted the couple may have been engaged at one point, they never made it official and that he never considered himself married to her. He argued that though a photograph showed him wearing what the judge called a "typical wedding band" on his left hand, he simply liked the ring, not that it signified marriage. The decision carefully articulates how they generally kept separate finances and never filed joint taxes. The trial to determine whether they had a common-law marriage lasted a year and a half. In her ruling, Asquith concluded "by clear and convincing evidence" that Angela and Kevin had been married by common law since 1995. "Essentially they took care of each other, financially, emotionally, medically and in every way where one would expect a husband and wife to consider their spouse," Asquith wrote. Kevin has filed a motion to appeal, and through his lawyer, said he preferred to comment for a story after that decision has been made. There's no formula or algorithm for determining a common-law marriage, and that can be confusing for courts. "The reasons why states like celebratory marriages, statutory marriages is because there is a fine line: You're either married or you're not. With common law, it's not so clear," Zavos says. "You always have to go and prove [your side] and there's always this uncertainty. The law doesn't like uncertainty. The law likes bright lines. So I think more and more states are recognizing that and getting rid of it." It's a legal relic left over, in this country, from the early days of the American colonies and from old ideas about marriage and couples that live together. Back then, traveling to find someone to officiate a wedding was difficult, and cohabitating and having children out of wedlock was socially unacceptable. Common-law marriage gave those couples legitimacy and a way to pass on property. "Today actually common-law marriage is becoming less common as a category because it's so easy to cohabit without offending your neighbors," says Garrison, the law professor. Common-law marriages have also tended to help women, who were often economically dependent on their partners. That legacy continues today. "A very typical context would be a woman has lived with a man and has been totally financially dependent on him. He's the one who's been earning money, she's been doing the housework. [It's a] very traditional kind of relationship, but they never officially got married," says Jill Hasday, family law professor at the University of Minnesota Law School. "[Without common-law marriage], she's not entitled to any Social Security benefits because that's all through paid work. If they were legally married, she could collect spousal benefits or if he's dead, widow's benefits. But because they were not officially married, she gets nothing." However, that presents an especially tough challenge. "That's why many states became hostile to common-law marriage," Garrison says. "The other 'spouse' is not there to give his or her version of events." In Alabama, an appeals judge argued earlier this year that she'd had enough of the legal murkiness of common-law marriages, especially given how easy it is in the modern era to get legally married. "In my view, no need for common-law marriage exists," Judge Terri Willingham Thomas wrote in a dissenting opinion of a divorce case. The cases, she argued, have taxed the court system for too long. "Common-law marriage should not be encouraged or tolerated when a bright-line standard for determining marital status is readily available. The legislature, by its silence, should not require the courts of this state to continue to struggle to separate fraudulent claims of marriage from valid ones when requiring parties who wish to enter into a marital relationship to obtain a marriage certificate would decisively solve the problem." So as couples live together in record numbers, should the unwitting common-law marriage be a concern? For couples who live together in states with common-law marriages and want their wishes to remain unmarried to be unambiguous, partners can write and sign a document stating their intentions to stay unmarried. Still, the changing face of the modern couple is shaping new laws designed to create some legal protections. "All around the world cohabitation is increasing and you're seeing a huge variety of legislative schemes are developed to respond to this," Garrison says. For example, Washington state offers couples in committed, cohabitating relationships that break up property rights similar to those afforded to married couples. If a couple in one of these "committed intimate relationships" separates, a court can help equally divide shared property and assets. And across Canada, unmarried committed partners who live together for a certain period of time or have children together are afforded some rights and benefits of married couples. In Norway, couples who live together and have children together are also given some marriage-like rights. Norwegian inheritance laws were changed in 2008 so that couples with children could receive up to $34,000 if their partner dies without having written a will. "Cohabitation has during the last decades been widely accepted in society in Norway; about a quarter of the couples (or a fifth of all grownups) cohabit, and more than half of the children are today born before their parents (eventually) marry," Katrine Fredwall, who helped write the law, says in an email to NPR. "To take on a more or less unpaid workload while caring for children, being the homemaker or working part-time, made in particular the mothers vulnerable and in need for protection by the law."